ADU Citizen Scientist Pieter Cronje has been in Cambodia and the Philippines training the police forces of these countries in human rights issues. In his free time, he was disappointed that he did not find any weaver nests in near his accommodation. During his classes he squeezed in a section about weaverbirds and his passion for taking PHOtos Weaver Nests for the ADU Virtual Museum. So one of his students, Chhay Menghor, went back to his village and took four sets of photos of nests in colonies of Baya Weavers. 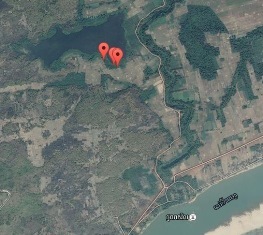 The 4 colonies are around a lake near the banks of the Mekong River near the village of Koh Tasuy, and these are the first PHOWN records from Cambodia. The Baya Weaver is found in some 11 Asian countries and there are PHOWN records for this species from 5 of these countries. See a summary for the Baya Weaver here, including basic biology and a distribution map. Whether you are in Africa or Asia, please upload your photos of weaver nest into the PHOWN (PHOtos of Weaver Nests) section of the ADU Virtual Museum.